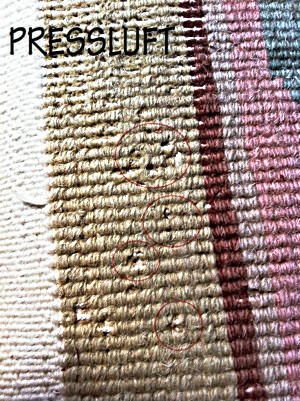 Case Making moths can do considerable moth damage to wool rugs. Adult female moths lay their eggs almost immediately after they emerge from the pupal case. Moth damage occurs when the moth is in the larvae stage and feeding on protein fibers such as wool. If left undisturbed they will eat until the food source (your rug!) is gone. 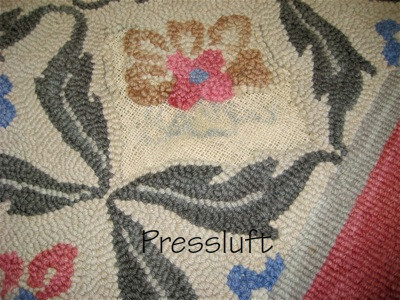 Look at how much wool has been devoured from this wool latch hooked rug!! Moths are usually found in dark, quiet rooms and places where the vacuum cleaner cannot easily reach, such as under chairs and sofas. They prefer to feed on dirty rugs, so if you plan to store a rug have it cleaned first. Clean rugs are less susceptible to insect infestation since important vitamins and minerals necessary to complete the moth’s development may be lacking. Indications of a moth infestation are small, flying adult moths. These flying insects indicate the infestation is considerable. Look for loose pile yarns on top of the rug, small depressions on the surface of the rug and or missing yarns on the back of the rug. Damage apparent before washing will look much worse after cleaning as the loose tufts will fall out from handling and agitation. 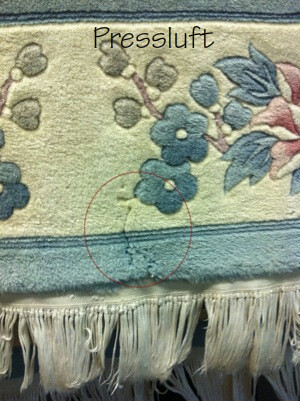 The most effective way to prevent an infestation and inhibit growth is to keep rugs clean. Routine vacuuming/cleaning of the rug and home are necssary to help prevent moth infestation. Some new rugs come into the U.S. with moth eggs and it may be a few years before the owner realizes their rug has moth damage. After cleaning and removing as many of the larvae as possible, you should consider having the rug treated with an insect deterrent. This product is not “bullet proof” but it is an additional step to prevent infestation. There is not a product that will guarantee that moths will not return. If you find moths in your rug it is likely that other furnishings in your home are infested too. If so, it may be prudent to contact an exterminator.